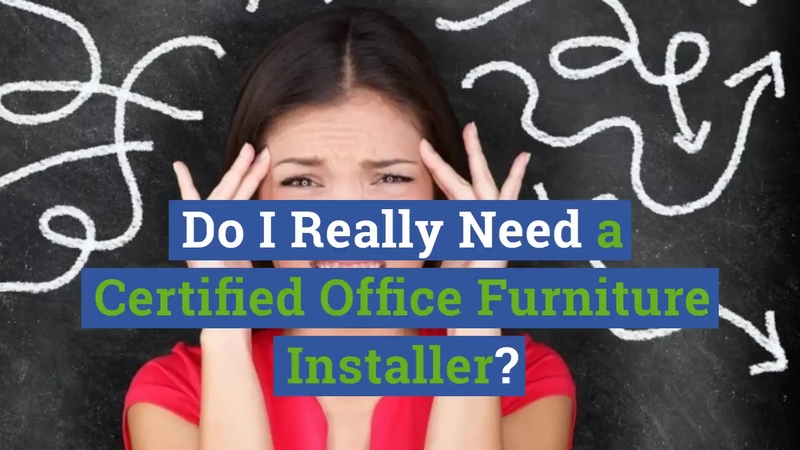 Do I Really Need a Certified Office Furniture Installer? If you're charged with overseeing the relocation, reconfiguration, downsizing, or long-distance move of your office, you are facing a logistical challenge. You are probably focused on timing your project to minimize company downtime and ensure that your team is able to resume normal operations as quickly as possible. You're also probably concerned about the costs involved with an office move. There are many ways to help keep costs minimized. Especially by re-using existing office furniture. Nearly every office move includes work stations, computers, and other office furniture that will need to be either rearranged or taken apart and then re-installed in the next office space. But do you know who to contact for certified office furniture installation? A moving company or an office furniture installer? Find out how a moving company is different from an office furniture installer. Factory-certified furniture installers, for the most part, only know the details of their brand of office furniture. But what if you have several different brands? Or you have some office furniture that's new but some that's being moved and re-installed? Who do you look to for help? A certified office furniture installer that's not affiliated with a particular manufacturer is often the right option for many businesses -- small or large -- when they have an office move or reconfiguration. Independent furniture installers, typically, are furniture assembly pros that have knowledge in many different types of office furniture brands. As with any business, office furniture manufacturers are focused on the bottom line. Furniture dealerships are similar to car dealerships: Both strongly encourage customers to have their products serviced only by dealership technicians, to keep profits in-house. This policy doesn't benefit customers. In many locations, there are minimal – if any – authorized dealerships. Customers find it difficult to find factory-certified office furniture installation help, especially when the furniture isn't brand new. When they finally do find a factory installer, they pay a premium price for this service. This is in part due to furniture dealerships eliminating competition by threatening to void product warranty unless products are serviced by factory employees. In reality, many experts agree it's not legal for manufacturers to withhold warranties. Fortunately, there's a better option: certified independent office furniture installation. In the 1980s, Houston Installation Services became the first independent certified office furniture installer. Not all furniture manufacturers have embraced this customer-friendly installation alternative. Companies including Haworth and Herman Miller still refuse to officially certify independent installers on their product lines. They're focused on keeping profits in-house rather than providing the best service to their customers. Other major manufacturers see the benefit of allowing independent companies to be certified – these include Steelcase, Hon, and Teknion. Where factory installers are experienced with one product line, an independent office furniture installers, like HIS, is certified and experienced in all product major office furniture brands. Since most offices have more than one brand of office furniture installed, it's often to the business' advantage to use an independent office furniture installer who can work with multiple vendors during one project as well as have the understanding of how to dismantle and reassemble office furniture that is going to be reused. As a customer, you have rights and negotiating power. Do not feel that you must be forced into dealer-only service for fear of losing your office furniture warranty. This could end up forcing you to deal with many different manufacturers' installers which is time consuming and assuredly will be more expensive than using a single, independent office furniture installer. Despite what the salespeople want you to believe, that threat is highly questionable from a legal perspective and it's unlikely a manufacturer will follow through when challenged. In fact, threatening to take your business elsewhere (to Steelcase, Hon, or Teknion, for example) may be sufficient for the manufacturer to reverse course and authorize you to use a certified independent office furniture installer. Here are five questions you may want to ask before choosing who will do the installation on your next project. Can a Moving Company Do the Same Thing? If you want to ensure your office move, downsize or relocation goes smoothly and you're not jeopardizing your furniture warranty, you absolutely do need to hire an office furniture installer rather than a mover. But you don't need to hire a manufacturer's installer. You'll get far better service from a well-rounded certified independent installer. There a few cases when a mover might be all you need. At Houston Installation Services, we warranty our office furniture installations for two years and we've never had a product defect occur due to installation inexperience. Is your office move outside of the Houston area? Not a problem. HIS can meet your office furniture installation needs in all 50 states by providing highly qualified independent installation referrals from InstallNET International. Hiring a certified independent authorized office furniture installer like HIS is a much better option than limiting yourself to a factory installer who only knows about one manufacturer's products. We encourage you to contact us if you're considering a move and need to find the right office furniture installers. We have 40+ years of office furniture installation and project management experience, and our team of certified installers offers specialized trained on the nuances of installing furniture and equipment from top brands including Steelcase, HON, Teknion, Herman Miller and Haworth. Originally published January 2017. Updated December 2018. Bill Miller joined Houston Installation Services, Inc. as the Operations and Sales Manager in 1988 where he worked until he purchased the company in 1994. Under his leadership, Houston Installation has grown to a $4.5 million business with 50 employees all specialized in the best way to help companies move, remodel or add office space.